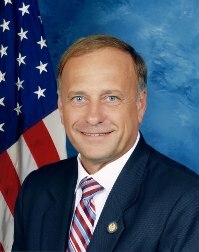 Many Democrats have long wished Steve King would be unseated from his Western Iowa congressional district. But now, after the conservative’s latest series of comments on race and nationalism that sparked controversy over the last week, the national GOP leadership and Iowa Republican Party are looking for a quick political divorce from the long-serving U.S. Representative. King was stripped of his committee assignments in the U.S. House and has already attracted GOP challengers for his party’s 4th CD nomination in 2020 by state Senator Randy Feenstra and businessman Bret Richards. Representative King maintains he has no plans to resign and intends to run for reelection in the 2020 cycle. The nine-term congressman was nearly upset last November by Democrat J.D. Scholten who came within 3.3 points of flipping Iowa’s most reliably Republican congressional seat. But while several Iowa U.S. Representatives have fallen short at the ballot box in general elections over the last several decades, it’s been more than 70 years since one has lost a primary. A Smart Politics analysis finds if Steve King fails to win his party’s nomination in 2020, it will end a streak of 196 consecutive successful renomination bids by Iowa U.S. Representatives since the 1950 election cycle. [Note: If no Iowa congressional candidate reaches the 35 percent threshold in a primary, the nomination is thrown to a district convention. King himself received his first nomination to the office in 2002 via convention after winning 30.6 percent in a four-way primary]. Iowa passed its primary law on April 4, 1907 after a decade of lawmakers attempting to bring the power of the nominating process into the hands of the people. The first U.S. House primaries in Iowa were conducted on June 2, 1908. Since that cycle, all but nine of the 387 incumbents running for reelection won their party’s nomination (97.7 percent). The most recent member of Iowa’s U.S. House delegation to come up short in a primary was seven-term Republican Congressman John Gwynne in 1948 – one year before King was born. Gwynne was first elected to the chamber in 1934 when he ousted Democratic freshman Albert Willford by 8.4 points in a cycle where Republicans lost 14 seats nationally. In 1948, however, Gwynne was challenged that June by journalist and fellow party member Harold Gross. Gross defeated Gwynne by 11.4 points with 55.7 percent of the GOP primary vote and went on to win the 3rd CD general election that November en route to 13 terms in the chamber. Since Gwynne’s loss, Iowa U.S. Representatives have rattled off 196 primary wins in a row with 16 other primaries held for open seats. Prior to the 1950s, it was more common – although still unusual – for members of the nation’s lower legislative chamber from Iowa to lose their party’s nomination. From the onset of the primary era in 1908 through 1948, approximately one in 20 incumbents running for reelection lost their renomination bids – nine out of 191 (4.7 percent). Republicans, who have largely dominated Democrats in Iowa’s congressional elections over the last century, account for eight of the nine failed renomination attempts since 1908. In that 1908 cycle, five-term Republican James Conner was the first casualty of the new primary law in a congressional race. Conner lost in the 10th CD primary by 12.0 points to the state’s GOP central committee chairman Frank Woods. Republican Earl Vincent, 1928 (9th CD): The freshman had served only a shade over a month after winning a special election when he lost to attorney Charles Swanson at a July 11th nominating convention. [Vincent had the most votes in the primary, but his 27.6 percent was well shy of the necessary threshold]. It should be noted that of the eight instances during the primary era in which Republican incumbents lost their party’s nomination, the GOP still held the seat all eight times in the general election. The only instance of a seat flipping after an incumbent lost a renomination bid since 1908 came after the aforementioned Democrat Sanford Kirkpatrick was defeated in the 6th CD primary by W.H. Hamilton in 1914. Hamilton lost the seat for the Democrats to C. William Ramseyer that November by 6.0 points. Of the nine Iowa U.S. Representatives to lose a primary, only one – 10-term Congressman John Hull in 1910 – served longer in the chamber than King. Ramseyer also served nine terms like King. Since Gwynne’s primary loss in 1948, a total of 41 Iowa U.S. Representatives have exited the chamber: 23 lost general elections, six lost bids for higher office, one died in office, seven retired, and four were elected to the U.S. Senate. 1 Comment on "Steve King Could Become 1st Iowa US Rep to Lose Renomination Bid Since 1940s"
1. Harold Royce Gross indeed represented the easternmost portions of the current North Central & Northwest seat that is undergoing a long-beleted intramural turmoil. Should King lose next year – at either the initial primary vote stage or, if needed, a runoff convention – it would confirm the adage that history at least RHYMES, if not precisely repeats (itself). 2. Which is the biggest factor in the seemingly sudden change of position on the part of King’s fellow R colleagues – that he nearly lost the “yellow dog” terrain last year after routinely being re-elected, and re-nominated; that he went to Central Europe and publicly drew functional equivancies between their ultra-right fringe parties and his own; or that he is no longer so valuable to the caucus now that the GOPpers are in the minority (except for 2007 through 2010 he has been part of a slim yet cohesive majority, hence the need to heretofore tolerate his virulently xenophobic and Aryan-centric views) ?